Indiana Department of Environmental Management Commissioner Tom Easterly announced his retirement on July 16. He will leave the office August 28. Easterly became known as a central global warming denier in the last few years as he shared his vision of using a State environmental agency as an economic development tool. He was also known for a pile of hazardous waste he authorized next to Lake Michigan as a consultant for ArcelorMittal Steel Corp prior to being appointed by Mitch Daniels in early 2005 to the Commissioner’s post. As soon as he was appointed Commissioner, Easterly met with Indiana legislators to tell them the direction of the agency had changed from primarily environmental protection to an economic development agency, according to legislators he met with. A bit later Easterly decided that enforcement of environmental rules was not important in Indiana and shut down the Agency’s Enforcement and Compliance section. From that point on, nearly every enforcement action against Indiana polluters was initiated by the USEPA and not IDEM. 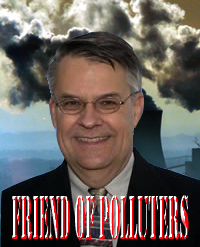 In his latter years, Easterly became know for his adamant opposition to any effort to curb climate change and warming, offering advice to power plants and others on what they might do to avoid compliance with EPA rules. His current boss, Mike Pence, listened closely and adopted Easterly’s narrow views as his own, announcing recently that Indiana would not comply with the Federal Clean Power Plan. Rejoicing at Easterly’s departure from the agency he managed is probably premature, however since it is almost a certainty that pence will appoint someone to the post wh shares his view of lax or no enforcement. Stay tuned. This entry was posted in Uncategorized and tagged corruption, IDEM, Indiana pollution, pollution. Bookmark the permalink.